Yippee… a newly purchased plant for our garden in June 2011! We got this beauty for only RM20! A very good bargain indeed as there were 4 plants in the pot. Had they been separately potted, each would had been sold at RM10 per plant or more. I love surprises! This purchase was not pre-planned. We had gone to a nearby nursery to capture some pictures of Dwarf Podocarpus and got side-tracked by the numerous pots of colourful Aglaonema cultivars on display, including Aglaonema cv. ‘Valentine’ that’s already happily residing in our garden. I just couldn’t resist grabbing a pot of this beautifully variegated Aglaonema and John, my ever-accommodating spouse who stood nearby nodded approvingly. I’m truly a sucker for colourful and variegated foliage plants. Aglaonema cv. 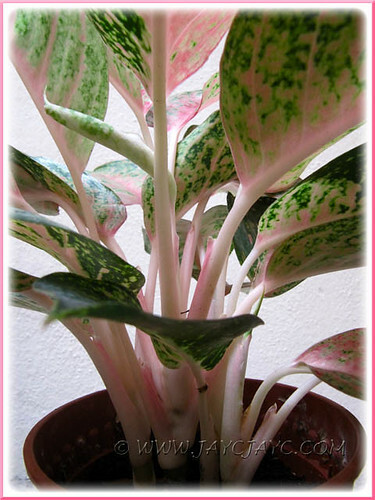 Legacy features colourful ovate leaves, in fabulous green hues and attractively marked with reddish to pink venation. Each leaf appears to be differently patterned and randomly blotched. I’m also fascinated with its distinct and uniquely coloured petioles in white and hints of pink… simply beautiful! Tip and stem cuttings of Yellow-vein Eranthemum that were obtained from the Little Sisters of the Poor Home for the Elderly in early May rooted easily in potting medium and flourished. Within less than a month, we were amazed to observe that the young plant that was propagated from tip cutting, surprised us with a flowering spike. How marvelous… we hadn’t known earlier that Golden Net-bush was floriferous and will start blooming so young. Truth be told, I had requested only one tip cutting while the rest were stem cuttings as I was more confident of the latter being good material for propagation. Hence, you can see that the tip cutting was just an afterthought and push into a pot of Angel’s Wing to accommodate it like a reject. Instead, it outshone the stem cuttings with its first flowering. Nature is so full of wonderful surprises and a great educator… I’m truly humbled! Wow! We’re delighted that these seedlings are growing very well after being replanted into a large pot in mid-June. They were taken from an abandoned area by the roadside and then back home straightaway to plant them to avoid dehydration and shriveling of plants. We’ll probably just retain two plants eventually to prevent overcrowding. 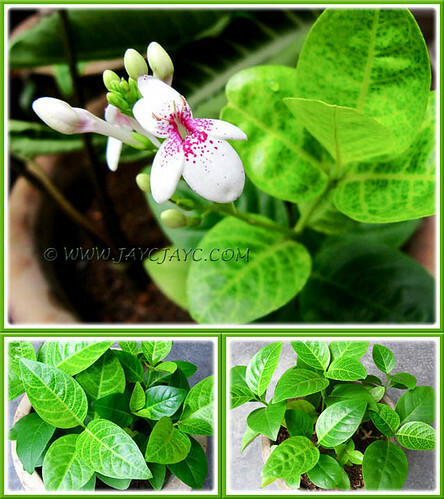 Also commonly known as Palma Christi and Wonder Tree, these shrubby herbs can be fast-growing under favourable conditions. 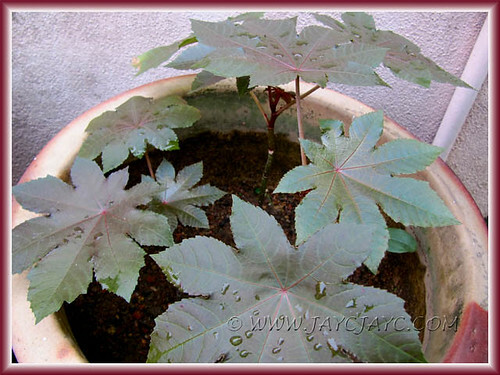 We’re absolutely looking forward to enjoy their lovely maple-shaped leaves and reddish-purple foliage to add color and interest to our garden. Waiting too to enjoy their flowers. Wonder how soon will that be? A couple more FOC plants for our kitchen garden, donated by Theresa Cheong who also gave us cuttings of Joseph’s Coat! We last grew this edible plant so long ago that we’ve totally forgotten how it’ll be like. Exciting really to anticipate each stage of its growth and to eventually savour our own home-grown veggie. Some seeds were sown last Sunday and we were amazed to see signs of life the next day itself. 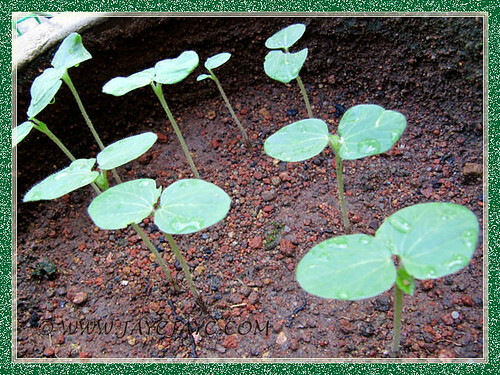 Photo above shows 5-day old Okra seedlings that germinated super fast after being scattered on recycled potted soil. A native of Africa and belonging to the Mallow family (Malvaceae), Abelmoschus esculentus is cultivated worldwide, especially for its culinary usages. We love Lady’s Fingers, whether stir-fried, steamed or curried! Read more about Okra at Wikipedia. 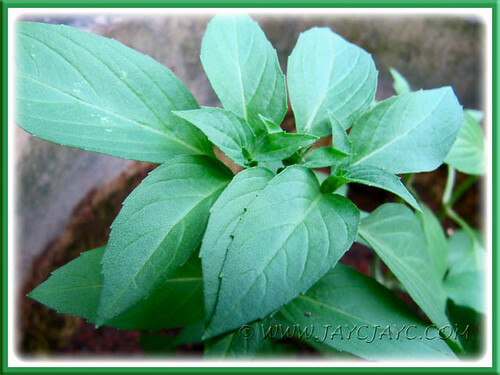 Basil leaves are not as familiar to us as the mint leaves, Mentha spicata (Spearmint or English Mint). When our friend, Theresa, suggested recently that we grow them with cuttings provided from her vegetable and herb garden, I was quite keen to venture forth. Reason being, I’ve often seen basil leaves being included for flavouring in many recipes at foodie blogs that I read and have often wondered what’s so special about it. Probably, we’ve tasted it many times in Italian and Thai cuisines without knowing its typical flavour. Well, about time to grow this popular herb, taste it and fall in love with it. We did try adding basil in a few dishes recently but the English Mint is still our preferred choice! Learn more about Basil at Gernot Katzer’s Spice Pages. This following sad event is just for our garden record. 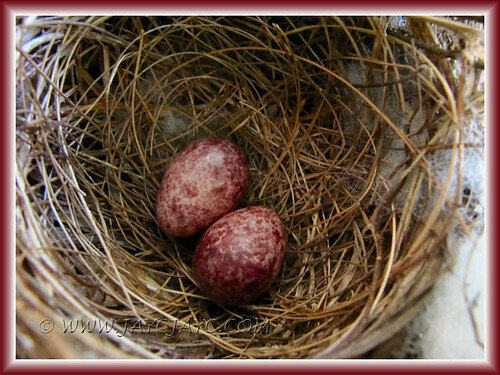 In June, a pair of White-browed Bulbuls (Pycnonotus luteolus) Yellow-vented Bulbul (Pycnonotus goiavier) had laid a clutch of 2 eggs again but sadly a predator squirrel that had been lurking around, had gobbled them mercilessly. Oh God, we pray that our Lady Palm tree will never be a breeding haven for this kind or any kind of birds again! We’ve seen too many disastrous events, the last was in March, just 3 months before. They do mourn for their loss, I found out recently. I was awakened early that morning, about 8 am, by the typically loud and chattering noises of the bulbuls and thought that they were celebrating the arrival of the hatchlings. Instead, when all was quiet a few hours later and the birds weren’t seen, I ventured outside and almost cried when I saw a scrap of egg shell on the floor below our potted Lady Palms. How very sad and disappointing for the pair! Probably, in future, we need to remove the nest before completion or shoo away the birds to save them from potential grief. 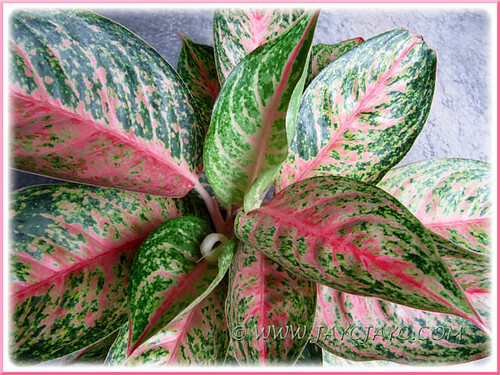 Your Aglaonema ‘Miss Thailand’ is lovely too. Does it like shade? Can it go indoors easily? Thanks, Nicola! Haha… owe it to you that I got to know firsthand about this lovely shrub. I’m overjoyed having them growing in our garden now. Unbelievable, I didn’t think it possible to get them so soon as I thought we had to travel to Bukit Tinggi, the place where you got your plant! Re Aglaonema ‘Miss Thailand’, I think it can easily be a houseplant but it’s better if you locate it where it can get dappled sunlight to bring out the brilliance in foliage variegation.